The government is planning registration of septic tanks, sewerage treatment plants and cesspit. This will be enforced by the Environment Agency. The system is already live in Wales and is planned to be in operation later this year in England. This means your foul (sewerage) drainage and tank will be monitored, and we have been advised that the registration will mean you are obliged to maintain and repair it, and be fully aware of your responsibility to do so. Our free insurance advice may be able to help if you are faced with an order to repair. 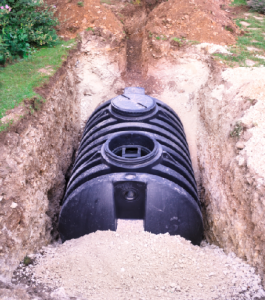 Failed Tanks are very common in rural Sussex, Hampshire, Kent, and surrey which quite often have been damaged by roots, a broken drain, or other problems such as a failed soakaway, run off pipe, Herring bone system or even the T-pipes missing. Old brick cesspits and septic tanks may need replacement and installation, of a package sewerage treatment plant or septic tank if necessary. This can be of low cost to the house holder and possibly free, along with the repairs to the drainage pipes serving the system. Call Blockbusters on 0800 0689282 for free advice, site visit and inspection, and possible free repairs to your drainage system.